When, where and how our solar system had begun? The research theme of our laboratory, "the early solar system evolution research group (Tomoki Laboratory)", is to elucidate the origin and evolution of early solar system based on the results of multi-discipline measurements and reproductive experiments of primitive solar system materials (primitive meteorites and interplanetary dust particles from asteroids and comets, and returned samples collected by spacecrafts). About 4.6 billion years ago, our solar system had begun as a protoplanetary disk that consists mainly of hydrogen gas with minor amounts of tiny cosmic dust. Within the disk close to the young sun, high-temperature processes such as evaporation and melting of the dust took place. The first solid material in the solar system, CAIs, and the second material chondrules formed in the disk by evaporation, condensation and melting of preexisting cosmic dust. CAIs, chondrules, and cosmic dust accreted to form small bodies in the disk. They are first planetary bodies in the solar system. Most of the small bodies further accreted to form planets such as Earth and Mars, but some remain as asteroids and comets. 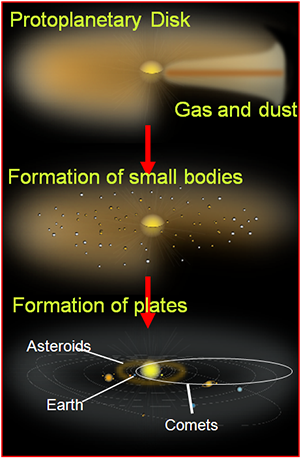 Therefore, small bodies such as asteroids and comets are very important to elucidate the origin and early evolution of our solar system. We are most interested in the evolution of small bodies containing "water (water ice)" which were common in the protoplanetary disk, and become building materials of Jupiter. Currently, such small bodies remain as C, P and D type asteroids in outer regions of the asteroid belt, and the Kuiper belt objects (short-period comets) existing beyond the orbit of Neptune. Our laboratory obtained primitive meteorites, dust particles, and returned samples (e.g., Stardust and Hayabusa missions) originated from small bodies, and performed mineralogical observations, and chemical, isotopic and noble gas measurements on them. Based on obtained data, we are trying to understand the evolution and formation processes of the tiny dust particles, the small bodies, the proto-planets and the planets. In recent years, scientific approaches to resolve the mystery of the solar system evolution had changed dramatically. Currently, we can collect materials from asteroids that we could only observe by astronomical telescopes in the past. We hope that our group and the next generation scientists who study primitive solar system materials will elucidate an entire scenario of the solar system evolution in the future. 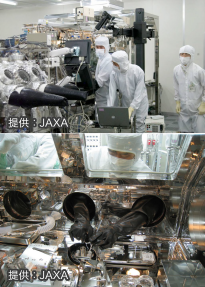 [Picture 1] Prof. Nakamura and other members of Hayabusa mission opened the sample container and identified asteroidal particles that Hayabusa spacecraft returned to Earth.